Dallas has gone through such periods before. Elm Street during the ’20s and ’30s, had a row of theaters there that really showed off the power of neon. Office buildings have also sported light through the decades. The Pegasus sign, outlined in red neon, dominated the Magnolia building beginning in the 1930s. The Republic office towers had a beacon at the tip of its idealized rocket ship in the 1960s, The Nations Bank Plaza (now the Bank of America building) was outlined in green neon soon after its completion in 1986. Its neighbor, the older Renaissance Tower, got its signature crisscross lighting during a remake a year later. But such buildings remained the exception in a largely darkened downtown. The lighting itself was usually an incidental feature. What is new is not just the recent proliferation of lighting, but designs that are increasingly bold and colorful.vThe trend has been driven by the development of light-emitting diodes as a decorative light source. Although more expensive than incandescent or neon lighting, LED is far brighter, more programmable, more energy-efficient and longer-lasting. Some Preparations: If possible, scout the location in advance during the day keeping an eye open for traffic patterns (light trails at night) and good vantage points. Make sure you are familiar with your camera and its operation as you will likely be making adjustments in the dark – bring a small LED flashlight with you so you can look at your controls and setup. Any camera that allow Manual operation and focussing will be fine. Having a stable support such as a tripod is essential. Using a remote shutter release trigger is a lot easier than using the cameras self timer – touching the camera can cause vibrations which will cause the image to blur. In some more advanced DSLRs, one can also use the Mirror Up setting, which locks the mirror in its open position in front of the sensor as the movement of the mirror itself can cause vibrations. Also, make sure you have a spare set of batteries – nothing more frustrating than running out of power once you have found the best location and composed your shot! ...and what about my Bike? This continues our Series from the Lone Star State, Texas where we recently spent a wonderful weekend of fun and exploration. Sunday was dedicated to Family. In the afternoon we hooked up with Kathleen’s Brother and his lovely Wife, ate some steak (OK, you have to in Texas) and tried to keep up with them as they sped away on their Harley. We wanted to capture some shots of Bro, so we set him up at his home and used natural light – it was close to Golden Hour so it was perfect. he wanted us to capture his Tattoo, w wanted to catch a bit of Texas Attitude…I think we got both! Shot with a Nikon D7000, handheld, 70-200mm f2.8mm – a great lens for shooting Wide Open! Of course, everyone can instantly spot/hear a Harley due to its unique sound (I like to call it “potato, potato potato”), but did you know that On February 1, 1994, the company filed a sound trademark application for the distinctive sound of the Harley-Davidson motorcycle engine: “The mark consists of the exhaust sound of applicant’s motorcycles, produced by V-twin, common crankpin motorcycle engines when the goods are in use”. Nine of Harley-Davidson’s competitors filed comments opposing the application, arguing that cruiser-style motorcycles of various brands use a single-crankpin V-twin engine which produce a similar sound. These objections were followed by litigation. In June 2000, the company dropped efforts to federally register its trademark! Crazy, eh? Hmm...if only I were a milipede... so many cool boots! Naturally, Kathleen and I equipped ourselves with new boots. I passed on the Ostrich skinned ones (they were great but did not fit my Hobbit-like feet) and went for comfort. Kathleen found a superb pair as well. They will take a while to break in, but afterwards (or so is said), they will be the most comfortable and enduring footwear ever. People love their boots so much that after many years wear and tear, they have them re-soled! Warning: Do Not wear new boots on an airplane! Your feet will swell during the high altitude flight causing you to jump out of your seat and try to yank them off due to, well, pain. If you did not bring your boot fork (don’t know what they are really called, but you put your boot’s heel into it and pull), then you may look somewhat weird to fellow passengers as you gesticulate in the aisle, tugging, cursing and apologizing. Then, departing the plane in socks, carrying your treasures in hand (The aircraft’s Stewards smiled with a knowing grin and mentioned their own woes with shoes at 28,00 ft). The modern-day cowboy boot is one of the most recognizable facets of American culture, and is dominated by the big five companies-Justin, Tony Lama, Nocona, Hyer, and Acme. Cattle ranching in the United States existed as early as 1767 in California, but did not begin until the 1820s in Texas. However, what most people think of when they picture the legendary cowboy lifestyle of the “hard-working man,” did not begin until 1867 with the construction of the transcontinental railroad. Joe’s new wife, Annie Allen, created the made-to-measure boot mail-order kit, a brand new idea for this market. The kit included a twenty-inch ruler, a chart diagramming foot and boot parts and a hand-written letter stating the prices of the few leathers that were available at that time: black calf, retan, and kangaroo. The business began to boom after the Justin family moved it to Nocona, Texas, whereupon Joe added his two sons John and Earl as partners in 1908, creating H.J. Justin & Sons. In 1910, the real growth began, with Justin boots being sold in 26 states, Canada, Mexico, and Cuba for $11 a pair. I'll take mine Black, steamed please! The show also features an Exhibition Hall where Vendors showcase their wares, ranging from John Deer Tractors, A-Frame Cabins, Texas Fishing Adventures, Red-Neck Spill Proof Wine Glasses (Mason Jar mounted on a Wine Glass Stem, sealing top included to prevent spills!) to Cowboys boots and of course Hats. We were fascinated by this Wall of Hats that seemed to go on forever. These are the highest quality and are steam fitted on location – very cool! The Southwestern Exposition and Livestock Show, known commonly as the Fort Worth Stock Show and Rodeo is the oldest continual running livestock show and rodeo. It has been held annually in Fort Worth since 1896. In 1918, the Stock Show held the world’s first indoor rodeo, and in subsequent years has been responsible for several milestones in the sport of rodeo. The Stock Show has provided millions of dollars in grants and scholarships from in its tenure and continues to provide hundreds of thousands of dollars annually to assist the future of agriculture and livestock leaders. It is now held every year between January and February. The event lasts 23 days and is home to the World’s Original Indoor Rodeo, displaying 36 performances of professional rodeo annually. In addition, the exposition offers a carnival/midway, live music and entertainment in the Rodeo Roadhouse, multiple kid friendly exhibits, over 22,000 head of livestock and over four acres of commercial exhibits. Annually, the event generates an estimated 1.5 million for the local economy drawing exhibitors and contestants from all over to the Fort Worth locale. An average of over 900,000 people attend the Show annually, representing more than 80 foreign countries as well as most U.S. states. 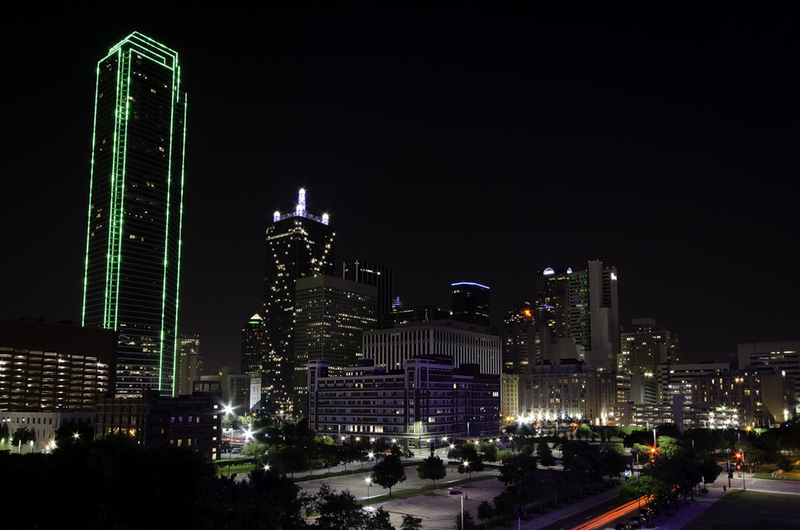 Eighty-five percent of the show’s events take place under roof, reducing the effect of the Winter weather known to local Fort Worthians as “Stock Show Weather.” On average, the modern Stock Show has an economic impact of over $100 million for the Fort Worth area. Initial Stock Show prizes consisted of gifts donated by Fort Worth area merchants. While this practice is no longer utilized, tremendous support from numerous breed associations, local Fort Worth businesses and many volunteer assist in raising cash amounts for livestock premiums. In 2009, a record $210,000 was awarded to Ricki Buckalew and her prize-winning European Cross Market Steer during the Sale of Champions. Millions of dollars are awarded annually to livestock and rodeo champions and participants. This is a Must See if you are ever in the area! Thanks for Visiting our Humble Photoblog and we hope to see you again soon – Subscribe to the Blog so as not to miss our next Post! During our recent trip to Texas, on the way home to San Diego, we stopped by Kathleen’s brother’s home and posed him on his Harley Davidson. We were experimenting with a few ideas that we will perfect for a photo shoot in San Diego this weekend. We will be using some off camera flash techniques using our powerful Quantum Q-Flash, perhaps an SB-600 Speedlight for background fill, some light modifiers and all on location close to Coronado Bridge. We have found that most Biker Shots are against garage doors, boring backgrounds (mostly Non-Pro), or in a full-blown Studio with complex lighting and often with a scantily dressed Models straddling the Bike. (Our Mother of will be doing our Security Detail)…..We will be doing something different! 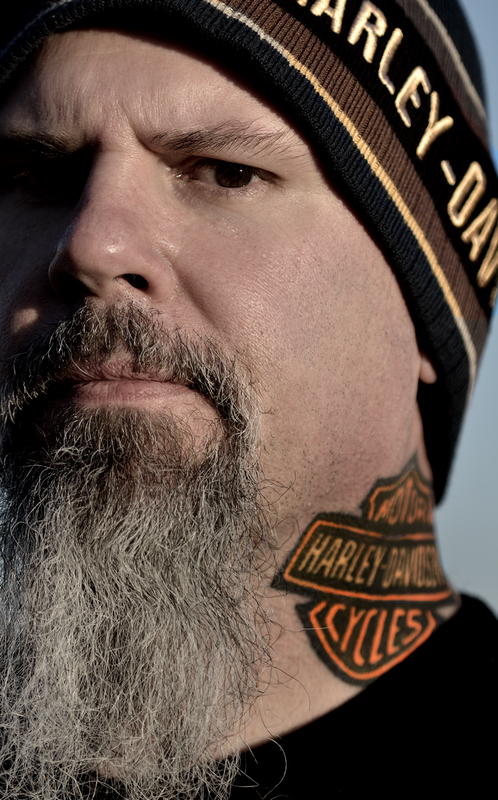 Now a bit about this Bike, the venerable Harley and its universally recognizable sound! 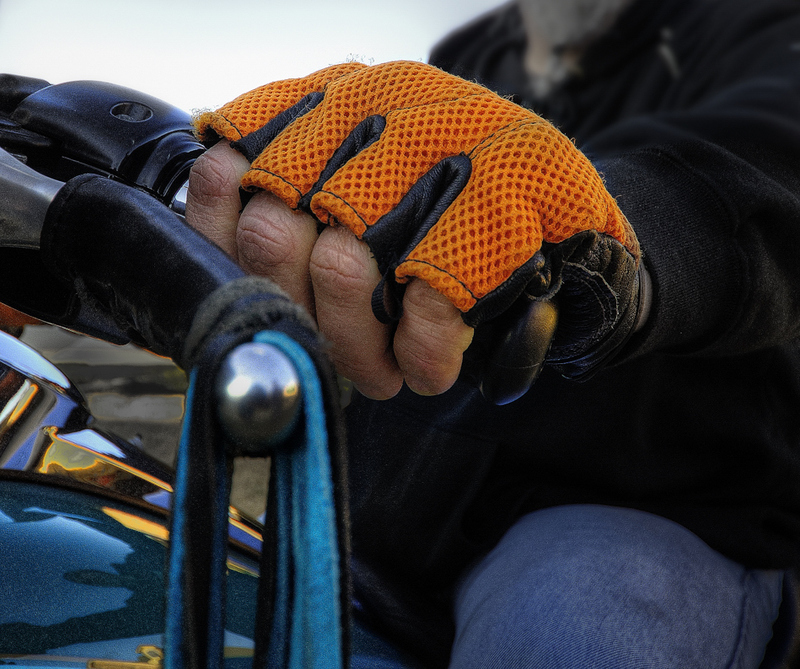 The classic Harley-Davidson engines are V-Twin Engines, each with a 45° angle between the cylinders. The crankshaft has a single pin, and both pistons are connected to this pin through their connecting rods. This 45° angle is covered under several US Patents and is an engineering tradeoff that allows a large, high-torque engine in a relatively small space. It causes the cylinders to fire at uneven intervals and produces the choppy “potato-potato” sound so strongly linked to the Harley-Davidson brand. To simplify the engine and reduce costs, the V-twin ignition was designed to operate with a single set of points and no distributor. This is known as a dual fire ignition system, causing both spark plugs to fire regardless of which cylinder was on its compression stroke, with the other spark plug firing on its cylinder’s exhaust stroke, effectively “wasting a spark”. The exhaust note is basically a throaty growling sound with some popping. The 45° design of the engine thus creates a plug firing sequencing as such: The first cylinder fires, the second (rear) cylinder fires 315° later, then there is a 405° gap until the first cylinder fires again, giving the engine its unique sound. Cool. eh? During a recent weekend visit to Fort Worth, Texas, we dropped by Cavender’s to check out their amazing selection of boots. Their inventory is beyond compare and of the finest quality. We both ended up with a new pair, and for Erik, his first ever. We also found this vintage truck on the front lawn and it just called out – do me in HDR (High Dynamic Range Photography). This was hand-held with a high-speed bracketted burst from the trusty Nikon D7000. Usually we always use a Tripod and remote shutter release, but sometime that is just not an option (did not pack a Tripod). Not too shabby I would say! Now a bit about this fine establishment! In 1957, founder James R. Cavender started Cavender’s Dairy Mart in Pittsburg, Texas. Eventually, in 1965, he decided to open a new business which featured the latest fashion trends in western clothing. The store was so popular that the chain grew to over 50 stores, located in 6 states. 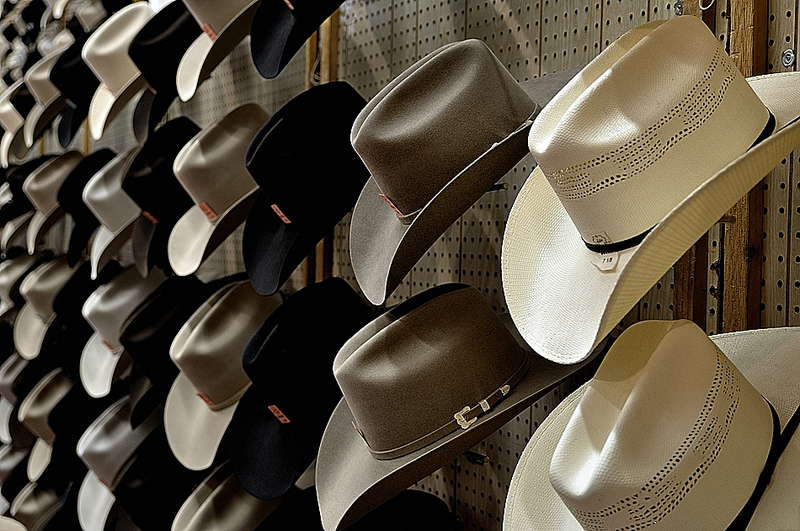 Cavender’s busiest times of year fall during rodeo season and at back-to-school. In Fort Worth, Texas, the rodeo is held in January, while in Houston, it occurs in late February and early March. In San Antonio, the rodeo comes to town in February. Often the stores carry the same general merchandise at each location depending on size of the location. Brands which you can see in most any Cavender’s location are Wrangler, Cinch/Cruel Girl, Justin Boot Company, Lucchese Boot Company, Anderson Bean Boot Company, Stetson Hat Company, Resistol Hat Company, Ariat Boot and Clothing company, and many others. Cavender’s is the exclusive outlet for Larry Mahan Clothing. This is a continuation of the “Adventures of Kathleen” in deep Texas. 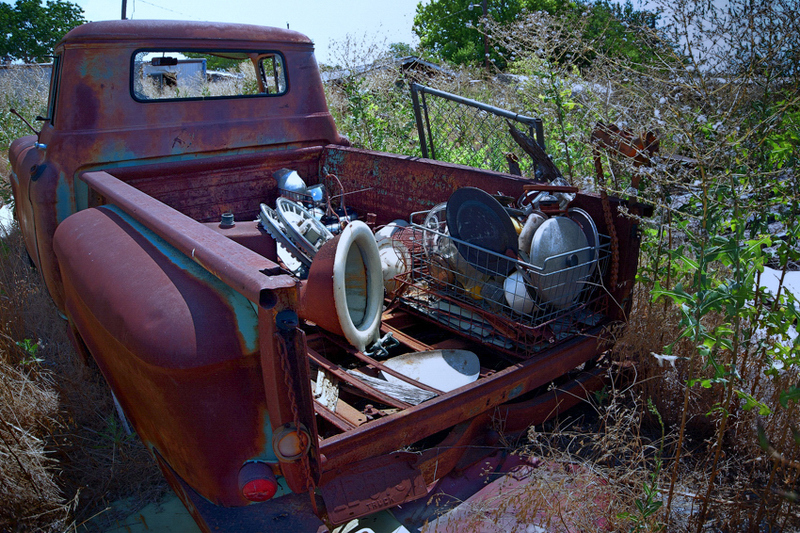 On the expanse of her Uncle’s Ranch she discovered the rusty beauty…ready to go Camping, complete with Frying Pans and Portable Toilet! This one was also equipped with a “See Clear Windshield”. She dared not get closer…one must be aware of Rattlesnakes! Now a bit about the Truck! The first F-Series truck (known as the Ford Bonus-Built) was introduced in 1948, replacing the company’s previous car-based pickup line. It was a modern-looking truck with a flat, one-piece windshield and integrated headlights. Options were the “See-Clear” windshield washer (operated by foot plunger), passenger side windshield wiper & sun visor, and passenger side tail light. The F-1 truck was also available with additional chrome and two horns as an option. Design of the F-Series truck changed little from 1948 to 1952. 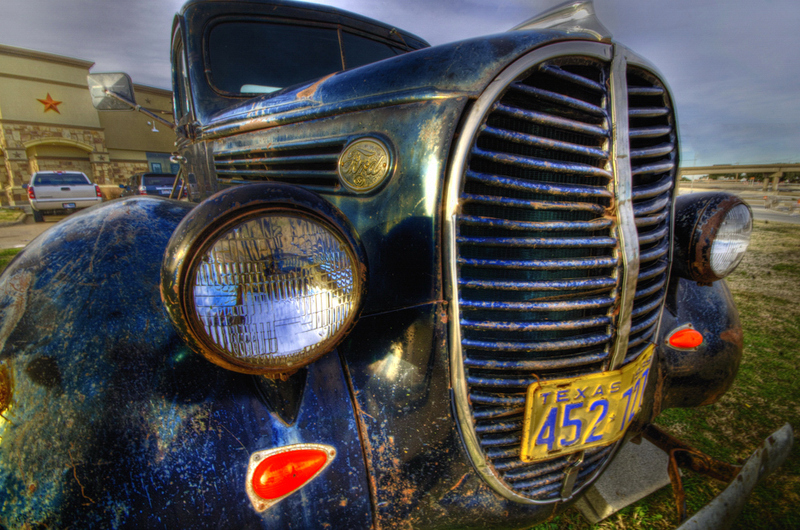 From 1948 to 1950, the grill was a series of horizontal bars and the headlights were set into the fenders. For 1951 and 1952, the headlights were connected by a wide aerodynamic cross-piece with three similarly aerodynamic supports. The rear window was wider in the later trucks and the dashboard was redesigned.